Welcome to this 168th edition of Maritime Monday. You can find last week’s edition here. This week’s photos are actually a documentary series. STV has the video series “The Merchant Navy“. See a review by THE MONITOR here. The screen shot is from the first episode. It was good. I can’t wait to see how it all ends. EagleSpeak has “Logistics: Testing Navy’s Improved Logistics Over the Shore“. Also be sure to check out EagleSpeak‘s weekly series “Sunday Ship History: The Great Korean War Sea Battle – that never happened” and I somehow missed the previous week’s edition “Sunday Ship History: Books“. gCaptain has “The Dangers of CO2 use in Firefighting – Videos“. Towmasters: the Master of Towing Vessels Assoc. Forum has “MARINERS WANTED: the Coast Guard is hiring civilian Marine Inspectors!“. Below is the text of an e-mail sent out by Cdr. Erich Doll of the U.S. Coast Guard’s Office of Traveling Inspectors. Cdr. Doll is an active merchant marine officer, who also holds an officer’s commission in the Coast Guard, and has been assigned the unenviable task of trying to communicate with and convince reluctant mariners into participating in the very system that most of us have little or no trust in. Deep Water Writing notes the final voyage of my first ship in “Scrapping an old home“. This ship was the NOSAC RANGER now sailing as the TELLUS. The Merchant Marine Express is still looking for a ship, any ship. The Maritime Executive notes the death of a merchant seaman at the hands of pirates and proposed legislation to permit merchant seamen to fight back in “Timing is Everything“. AMVER Blog has “Amver Container Ship Rescues Italian Sailor“. Rescued was Gianfranco Tortolani, who was sailing in the Original Single Handed Trans-Atlantic Race. 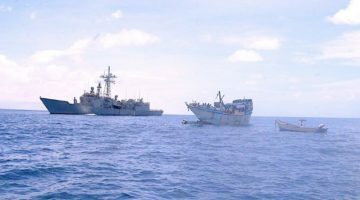 MarineBuzz has “Varuna 2009: Indian Navy Exercise with French Navy” and “Chennai Port: MV Captain Ali Without Any Instructions“. Puget Sound Maritime has “USCG Auxiliary celebrates 70 years, swears me in as a member” and photos: “Seaspan Resolution, ready for delivery“. Arctic Focus has “Canadian historian doubts Arctic trade route will matter“. Dyer said the passage is too narrow and shallow in places even when it is ice free, and that most marine insurers would not consider insuring ships on such a route. One Free Korea has “U.S. Won’t Board Suspected N. Korean Arms Ship“. The North Korean ship Kang Nam I may be carrying missiles to Burma, and then again, it may be headed for a stopover in Burma as it transits to points west. And then again, it may merely be carrying “small” arms and bullets for shooting dissidents and uppity monks (for which their next of kin will be duly billed). The official Burmese version is that they aren’t expecting the Kang Nam I in any of their ports. See, it would have been better to keep this a secret. Why proclaim that the North Koreans are proliferating arms and then do nothing about it. I bet the North Korean shipping company is not suffering from any lack of cargo, given that they seem so have immunity from any sort of legal enforcement. US Naval Institute Blog has more on the North Korean ship and China’s protective hand in “The Toothless Lion and the Enabling Dragon“. Casco Bay Boaters Blog has “Mystic Seaport Opens Exhibit Detailing the Restoration of the Charles W. Morgan” and “52 Maine Lighthouses to Open for Public Tours“. HollandAmericaBlog is searching: “Where In the World Is Nieuw Amsterdam’s Horn?“. I hereby send you something special. It’s a photo of the steamhorn of the s.s. Nieuw Amsterdam II (1938). This horn is one of the components which are saved from the ship before it was scrapped in Taiwan. The photo was made by a Dutch member of the “Kombuispraat” forum during “Dordt in stoom” in 2006. Wouldn’t it be a good thing if it was made possible that this horn can put on the newbuilding Nieuw Amsterdam just like Cunard did with the QM2 ? The only problem is that we have to find out where the horn is at this moment and who is the owner. Lloyd’s List has “Operation Atalanta halves risk of Somalia hijacking“. I do not see what the problem is. The flag-states probably have a blanket position on whether this is permissible or not, such as Malta which does not permit armed teams. It can’t be too hard to quickly know which Flag-States permit such activity and which do not. If it is specific problems such as a possible needed dispensation, then perhaps they need to be a little more proactive in their requests. On the good side, it is great to see that they are putting armed teams on merchant ships. That is the solution to fighting the pirate threat.. The Mississippi Press has “1 stowaway dies after fleeing ship“. Daily Telegraph (Australia) has “Almost 200 boat people intercepted“. CG Blog has “Some Coast Guard Mascots… oh so creepy“. iCommandant – Web Journal of Admiral Thad Allen has “All Hands: GALLATIN/DALLAS in drydock in Charleston“. Sea * Fever has “NOAA DYI ROV (aka mini-submarine in a bucket)“. Maritime Information Centre has “Newbuilding cancellations exceed 1,000 mark“. Maritime Accident Casebook has “Good News: Lifeboats Get A Gaze In September” as they come under increase scrutiny by various Port State Control authorities in the coming months. HAWSEPIPER: The Longest Climb has “they that go down to the sea…” as he remembers the person who was his inspiration to go to sea. 59° 56′ N has “Biogas-powered ferry by 2020?” It probably depends on who gets to pay the massive added cost for the fuel. Bryant’s Maritime Blog has “Jet ski accident is within admiralty jurisdiction“. The US Court of Appeals for the Ninth Circuit ruled that a claim for personal injury by a person who fell off a jet ski while it was being operated on navigable waters comes within admiralty jurisdiction. In the instant case, plaintiffs were injured when the jet ski on which they were being carried as passengers was operated negligently. The incident occurred on waters of Mission Bay, near San Diego, reserved for use by such vessels. After the accident, the owner of the jet ski (who was not the operator) sought exoneration or limitation of liability in federal court. The injured passengers opposed the petition, asserting that the waters involved were not used for commercial activity and that jet ski operation was not a traditional maritime activity. The trial court ruled in favor of the passengers, holding that there was no admiralty jurisdiction over the incident. The jet ski owner appealed. The appellate court held that because the waters involved were within the ebb and flow of the tide, the location test for admiralty jurisdiction was satisfied. It further found that the nexus test for admiralty jurisdiction was met because the tort alleged, harm by a vessel in navigable waters to a passenger, had a potential effect on maritime commerce and the general character of the activity, operation of a vessel in navigable waters, had a substantial relationship to traditional maritime activity. The case was remanded to the trial court for consideration of the petition seeking exoneration or limitation of liability. Mission Bay Jet Sports v. Colombo, No. 08-56142 (9th Cir., June 24, 2009). National Geographic has for it’s 23 June 2009 photo of the day: “Rowboat, Ngo Dong River“. The Chronicle has “Plaque to remember lives lost“. They were prisoners on the Japanese ‘hellship’ MONTEVIDEO MARU which was sunk by a US Submarine. BarentsObserver has “New drilling rigs for Arctic climate“. The AKER SPITSBERGEN and AKER BARENTS, noted to be the World’s largest. The Atlantic has “The Mystery of Cheap Lobster“. (Found via Instapundit) I promise to do my part and eat as much Maine lobster when I make my trip up there in July. But here’s the problem–and this is the key to understanding what’s happening now. Way before our current recession began, lobstermen were doing such a good job conserving their resource that beginning in the 1990s, they were already catching more lobsters than the market could sustain. There’s never been enough demand for all those live lobsters. They’ve always had to go somewhere else. Shipgaz News has “Western Shipyard christens WindLift1“. She is being built for equipping and maintaining Bard Engineering’s windpower stations in the North Sea, 100 kilometres from the coast. Tugster has great photos from on the water in “Clearwater“. Breakbulk Industry News has “Hamburg SÃ¼d delivers heavy lift helicopters to U.S. West Coast“. BitterEnd has “Four aging Washington state ferries sold for scrap – again“. Panbo has “Mcmurdo Fast Find PLB, Ritter tested“. That would be a Personal Locator Beacon. The Old Salt Blog has “Zuni, the “Mighty Z” – Survivor of Iwo Jima and the “Perfect Storm” may have a New Home“. Lighthouse News has “New Windows For Roundout Lighthouse“. Freaque Waves has “Peggy’s Cove“. A woman swept into the sea near the famous Peggys Cove, N.S., lighthouse after venturing too close to the water was rescued Tuesday afternoon. She was in the water for about 12 minutes before grasping a life-preserver thrown to her, RCMP Cpl. Joe Taplin said. Rescuers were able to pull her back up onto the rocks. The Stupid Shall Be Punished asks “What ports have you been to where it’s worth your while to hit the beach in uniform?” Seems that Norway is a popular choice. I only made it as far as Finland. Greenpeace finally encounters seafarers who use force to protect their ship in “A black eye for Emma and a step forward for bluefin tuna“. After the vessels refused our polite request to allow us access, Emma stepped on board to press the point. She was immediately attacked – they punched her, pulled her hair, picked her up and threw her overboard. One person hurled a large wooden pallet which whistled by our heads, and another tossed a full bucket of paint into one of our boats. If either of those had hit their intended targets, someone could have been seriously injured, but fortunately no damage was done. Note to Greenpeace: Boarding ships, way uncool and illegal. Sailors can use force to keep you from boarding. And now they are discussing arming crews. Cruise bruise has “Father’s Day Massive All Out Brawl On Seattle Docked Cruise Ship“. THE ISLOMANIAC has “Hart Island, New York“. The BBC has “Many sharks ‘facing extinction’“. “The EU finning ban is one of the weakest in the world,” she said. “The best, most sure-fire way to enforce a ban is to prohibit the removal of fins at sea. This rule was designed to prevent finning, but it provided “wiggle room”, said Ms Fordham. “The IUCN has estimated that, under these rules, you could fin and discard two to three sharks for every shark you keep, ” she explained. The BBC also has “Whale-watching ‘worth billions’“. I hope so. I am going on a whale watching trip in July. Helsingin Sanomat has “GTS Finnjet proving to be financial nightmare for Indian shipbreakers’ yard“. According to information acquired by Helsingin Sanomat, for the gigantic ship scrapyard Rishi Ship Breakers, the GTS Finnjet has been possibly the most troublesome exercise in the company’s history. GTS Finnjet has already cost the company in excess of EUR seven million. The non-profitability of the deal results from the slowness of the demolition work and the steepling nosedive of the price of scrap iron and steel. After the GTS Finnjet nightmare, the company wows not to purchase another passenger vessel for demolition ever again. TimesOnline has “British sea bed ‘trawled into a wasteland’“. THOUGH still an island, Britain is now surrounded by desert. New research has shown that repeated trawling has turned much of the sea bed around the UK into a barren wasteland. Scientists using deep sea photography and painstaking analysis of hundreds of years of fishing records have discovered an underwater terrain, once rich in species such as oysters, that has now largely been denuded of life. Their study also suggests that Britain’s coastal waters may have turned from sparkling blue towards a dirty greyer colour, partly because of the destruction of shellfish beds. Notwithstanding Greenpeace‘s stupidity above, they also have “The Bottom Line – presented by Sigourney Weaver“. Bottom trawling is laying waste to the precious ecosystems of the deep sea. Sigourney Weaver calls on delegates of the UN to take immediate action to stop this destruction. US piracy kill bill introduced – A REPUBLICAN on a US maritime congressional panel has introduced a bill that would give immunity to seafarers who kill or wound suspected pirates. Frank LoBiondo, a New Jersey congressman, iproposed the US Mariner and Vessel Protection Act on 19 June. It would also allow armed US Coast Guard officials to ride aboard and defend US-flagged vessels in pirate-prone waters. The legislation was introduced two months after the US-flag Maersk Alabama was hijacked by Somali pirates. China to convert naval port – BEIJING is following up its trade initiative with Taiwan with a plan to convert part of naval facilities in the western Taiwan Strait to commercial use. The official China News Daily said yesterday “a verbal contract” has already been reached for China’s navy to withdraw from the Sandu’ao harbour region and from Sandu Island. The newspaper cited harbours at Fuzhou, Xiamen and Meizhou Bay as priority development targets. Please submit articles for inclusion in next week’s edition using the following submit form at Blog Carnival. You are also welcome to email stories and photos to [email protected] for inclusion in future editions as well as suggest areas of coverage. Previous Editions: As linked below or click on the tag ‘Maritime Monday’ for all gCaptain editions.